Ran across yet another interesting Atkins-related law review article by Blume et al. (click here for other article recently posted). Blume, J. J., Johnson, S. L. & Seeds, C. (2009) Of Atkins and men: Deviations from clinical definitions of mental retardation in death penalty cases. 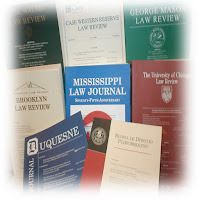 Cornell Law School Legal Studies Research Papers. Click here to view or download. I've signed up for their "alert" service regarding articles related to the death penalty and will post links to those that may be of interest to ICDP readers. Under Atkins v. Virginia, the Eighth Amendment exempts from execution individuals who meet the clinical definitions of mental retardation set forth by the American Association on Intellectual and Developmental Disabilities and the American Psychiatric Association. Both define mental retardation as significantly subaverage intellectual functioning accompanied by significant limitations in adaptive functioning, originating before the age of 18. Since Atkins, most jurisdictions have adopted definitions of mental retardation that conform to those definitions. But some states, looking often to stereotypes of persons with mental retardation, apply exclusion criteria that deviate from and are more restrictive than the accepted scientific and clinical definitions. These state deviations have the effect of excluding from Atkins’s reach some individuals who plainly fall within the class it protects. This article focuses on the cases of Roger Cherry, Jeffrey Williams, Michael Stallings and others, who represent an ever-growing number of individuals inappropriately excluded from Atkins. Left unaddressed, the state deviations discussed herein permit what Atkins does not: the death-sentencing and execution of some capital defendants who have mental retardation.